kick – a big kick. Killer Bees. Painkillers. No See Ums. Voodoo Punch. Bushwhackers. 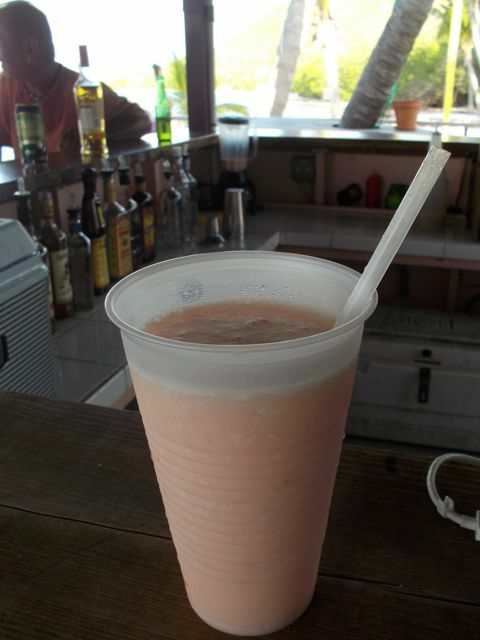 I love the names of iconic Caribbean cocktails. Some of ‘em taste pretty darned good, too. Of course, when our newfound cruising friends, Colleen & Michael of Goldilocks (clickhere to see their blog – lot of excellent sailing videos and photos) suggested, the No See Ums at Da Loose Mongoose, I was definitely game. I liked the idea of biting back no see ums, which bite much like mosquitoes, but are much sneakier. They like me; the feeling is not mutual. Also known as sand fleas, they’re too small to see, hence the name. Unlike mosquitos, there’s no warning buzz, before during of after their flesh-easting feasts. blackboard. She didn’t erase it, either. 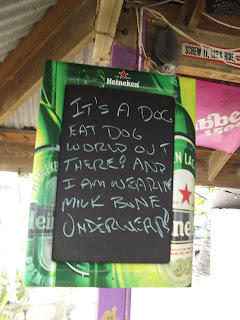 Humoring me, Wayne and I dinghied over to Da Loose Mongoose, a quirky beach bar at Trellis Bay, Tortola and ordered up one no see um each. Leslie pulled out about a dozen bottles, a several unmarked jugs and poured away, then blended them into a potent smoothie. Not everything out, went in, but here’s what I saw… no guarantees or ratios…. I’d rather drink a Painkiller even if they were the same price. No See Ums are a more generous serving, but $7-8 versus $5 for a non-Happy Hour Painkiller. Ironically, I got probably 30 no see um and / or mosquito bites drinking my No See Um. All while I’d contemplated my blog headline: Biting Back No See Ums. Da Loose Mongoose offers complimentary sprays of “Off;” foolishly I neither used my own insect repellant nor theirs. Damn; mother nature’s no see ums won that round after all! Discovering Oldest US Lager – in the Caribbean! Final Brushstrokes – and -- RAIN! Naked Outside in the Rain @ 3 a.m.